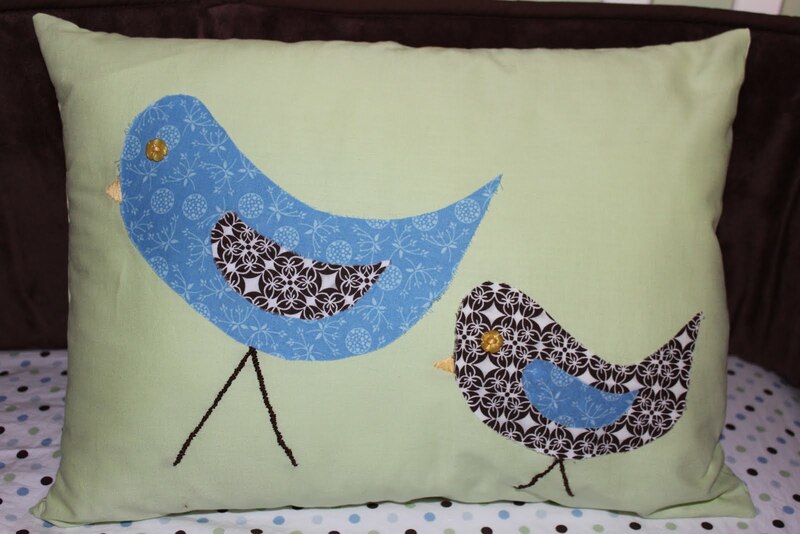 This super sweet pillow will be residing in my chocolate brown glider if it ever gets here! I decided that I wanted to do a bird theme for the nursery and knew I needed a few more birdy friends for the nursery besides the ones on the mobile to make it a truly comfortable nest. 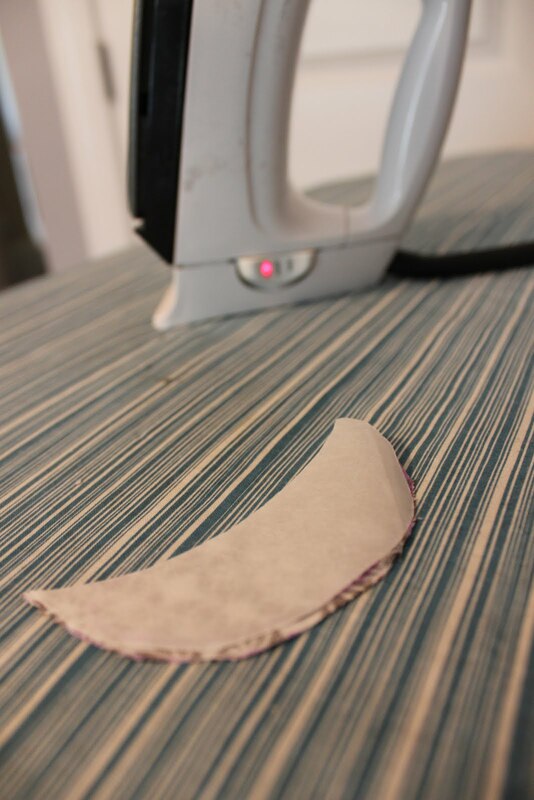 First things first, cut your pillow covering fabric to size depending on the pillow form you purchased. I followed these directions to make my pillow cover removable for easy washing. Then I drew out the bird shapes I wanted on just a plain sheet of computer paper and cut it out with and exacto knife. It was nice to be able to play with the sizes on the top of the pillow form to make sure I had the correct sizes. 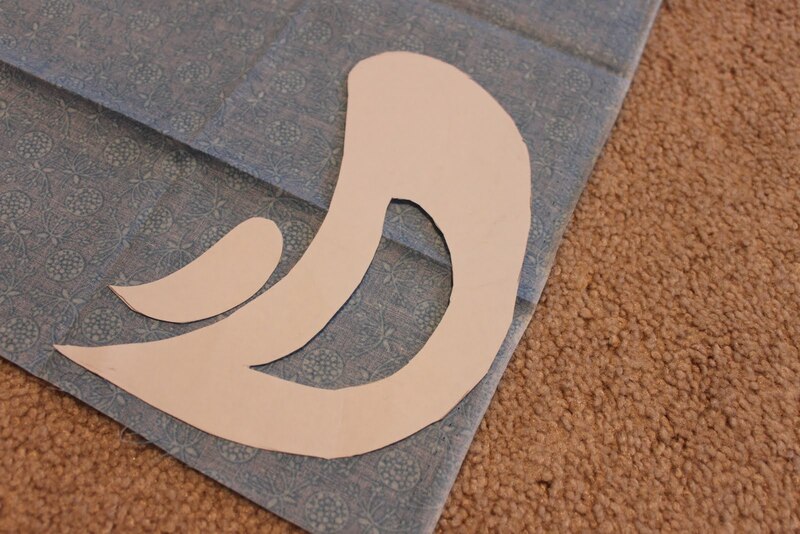 After that I traced the pattern onto the fabric with the fabric marker and cut out the shapes with the rotary cutter. Next I traced out the shapes on the smooth side of the Wonder-Under transfer web and cut those out with the exacto knife. 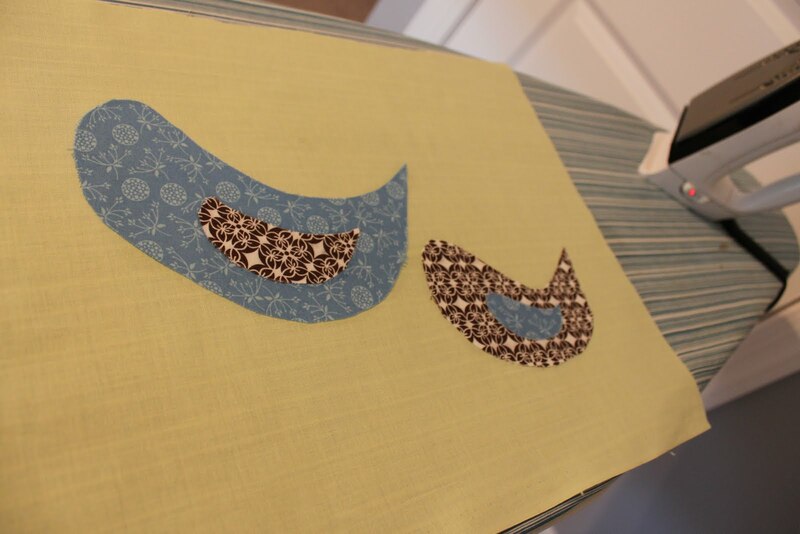 Match up your wing pieces only to the wonder-under shapes, rough side down and iron on setting 4 (no steam) and let cool. After they have cooled peel off the paper and they are ready to be placed on the bird body shape. Iron again and cool. 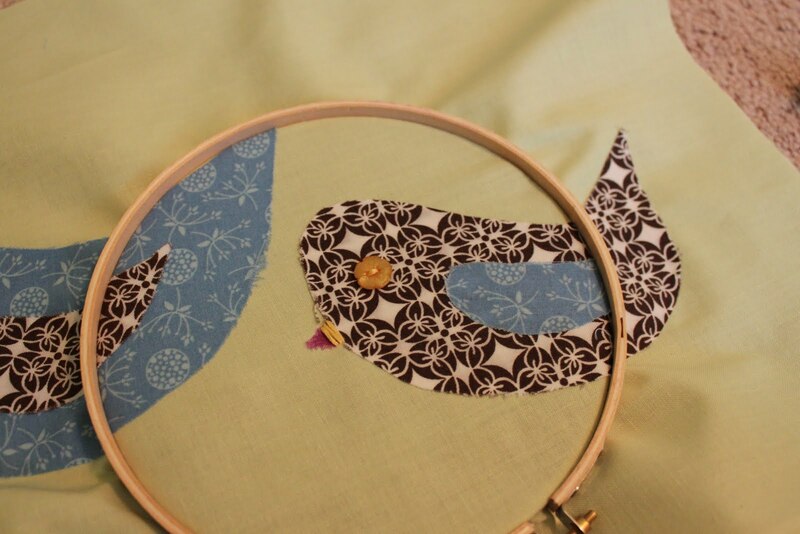 Next match up the wonder-under bird body shapes to the fabric shapes and iron again. Peel and place where desired on the top piece of your pillow cover. Now it's time to really make them look like birds. 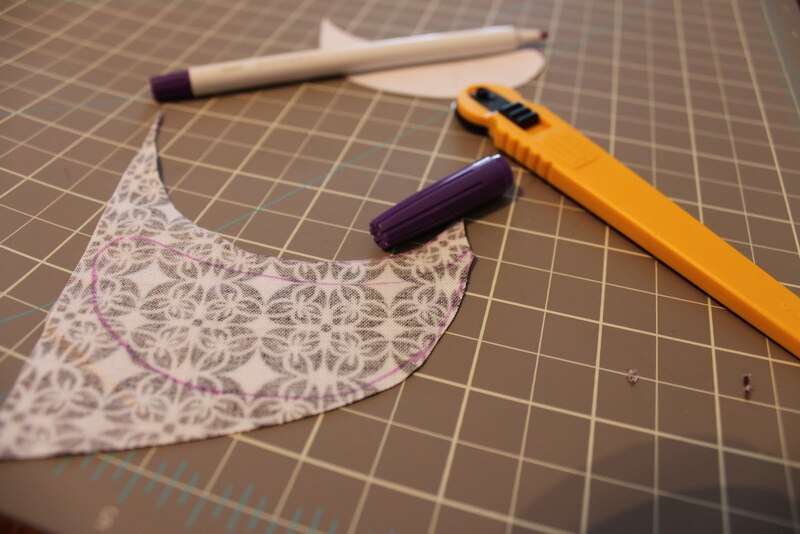 Draw out your beaks and legs with the fabric pin. Now you are ready to put your pillow together and this project actually requires sewing. 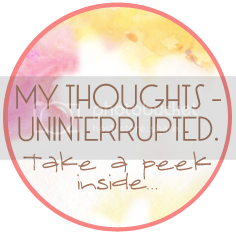 I had to borrow my mom's sewing machine, but it was really simple to put together following the link I gave you above. I pondered on doing it with the no-sew stuff I used to make the curtains, but just wasn't sure if it would hold up for this one.